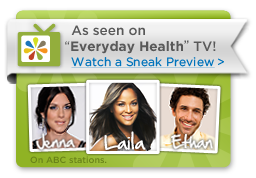 Everyday Health Heroes with Ethan Zohn, Jenna Moraska and Laila Ali! Hi everyone! Thank you so much for stopping by our foundation website. We had such a great time filming Everyday Health with Ethan and Jenna! You can click to see the previews! Meanwhile, we had just started a foundation for other children and families living with Cystic Fibrosis. We did a flash mob to kick start the foundation. It went so well that we were thinking about doing it again but we had not put much thought into it until Everyday Health contacted us. They said they would love to do another one with us/for us. That sort of sold us on it! They were scheduled to come film in about a month so we just went on with our normal life. Sadly, I caught a virus that reacted with mouth sores caused by my chemotherapy. I got lesions in my mouth and down my throat the same time filming started! It was crazy, but I was able to talk and eat, just not very well. We tried everything to get rid of them but it had to run it’s course. The first day we started, I got to meet Ethan and Jenna, they were awesome! It was great talking to them about our foundation and what it is like living with a disease like this. I think Ethan really understood having gone through his cancer. The next day, we took them to the Doctor’s appointment with us. It was strange, I am not used to being filmed while he listens to my lungs and gives me a check up but it was great showing them that hospitals aren’t so bad. I have been a patient at Long Beach Memorial Hospital on and off since I was 4 years old..they have the BEST doctors and nurses! Day 2 also had a big surprise for us..I won’t give it away in case you haven’t seen the episode yet but it was unbelievable! During all of this, we had been rehearsing our flash mob dance and trying to round up participants, get the music right, find the location, etc…it was a lot of work and a lot of fun. Everyone with Everyday Health, The Pretenders Dance Studio and our community really came together to support us. We are so grateful! Finally, the big day was here..time to DANCE! Okay, so Ethan and I are not the best dancers but this was all about having fun and raising awareness for cystic fibrosis and Claire’s Place Foundation, Inc. We had done a flash mob before but this one seemed so much more full of impact and purpose. I think everyone was a little nervous..and, that day my mouth was really hurting. All the energy and excitement made me forget about the pain for a little while, I felt on top of the world. A flash mob is really an amazing, joyful event..looking around at all the smiling faces was such a rush and knowing that people would be seeing this and maybe taking a minute to learn more about cystic fibrosis was a good feeling. Thank you to everyone at ABC and Everyday Health for the amazing, once in a lifetime experience! Keller Williams in Los Angeles recently did a beautiful fundraiser supporting Claire’s Place Foundation. We all thank you so much for your generosity! Having some fun with the vest…holiday caroling!! This is a great thing to try with younger kids, especially if they have to spend the holidays in the hospital. It happens, let’s make the best of it! We would like to thank our generous supporters at NorthStar Moving Company. They have been dedicated Claire fans since the beginning, featuring Claire as the face and voice of their blog "Moving Happiness Home", sitting on our board of directors, promoting and sponsoring our fundraisers, and encouraging us every step of the way! Sign up to get updates and event information delivered to your inbox. © 2018 Claire's Place Foundation, Inc. All Rights Reserved. © 2019 Claire's Place Foundation. All Rights Reserved.